This turned out to be a ton of work for very little return. I need to find another recipe. 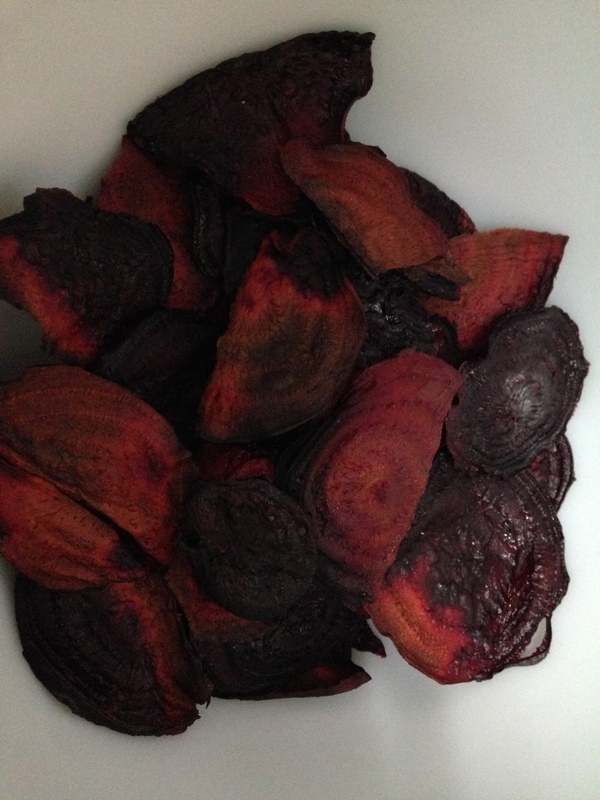 I have faith that beet chips can be made at home. I used to love the beet chips at a bar in Urbana, IL, Crane Alley. They served them with a goat cheese dip that was just unreal. I’ll be honest, though. I think those were fried. That might really be the secret here. Don’t send the oven to do a deep fryer’s job. I busted on the mandoline for this one. I followed the instructions where you stack cookie sheets on top of each other in the oven! I tried to follow the instructions about taking them out when they “changed color” and believed them when they said they would be crispier as they cooled. They didn’t. These were, for the most part, soggy little discs of beet that took forever and created a ton of dishes. Sad trombone… But I’m keeping the faith because those handful of chips that actually were crisp were really tasty. I sprinkled them with smoked sea salt to approximate the taste of barbeque chips. Ok, let’s move on to the real stars! I made a recipe that I’ve been dying to make since I first got on Pinterest. 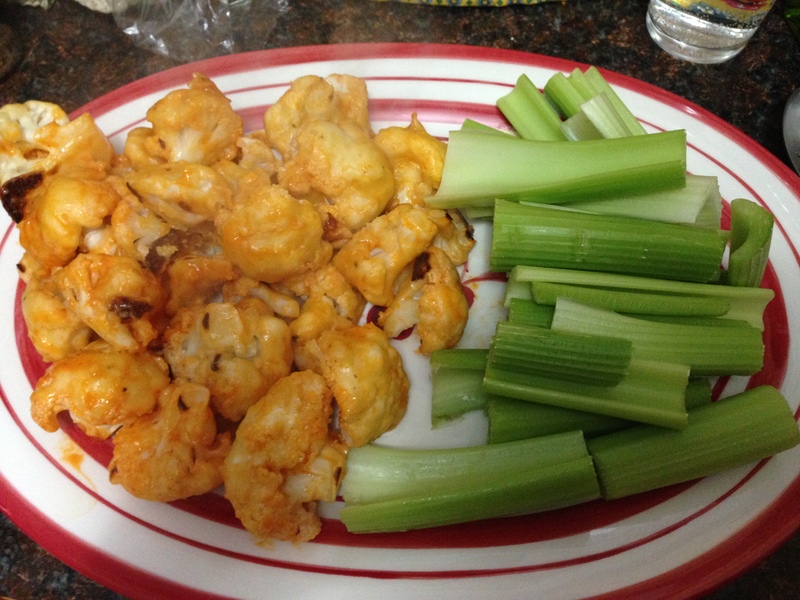 The buffalo cauliflower. Yes, Pinterest fans! That one! What a cool recipe. You basically batter some cauliflower florets with a buttermilk batter, bake them in the oven (while wishing they were deep fried…), then toss them with buffalo sauce and serve them with blue cheese dressing. Is it good? My word, yes. Does it taste like buffalo wings? Don’t be silly. Of course not. It tastes roughly like roasted cauliflower with a tangy buttermilk pancake wrapped around it, all doused in buffalo sauce. If that sounds good to you, you’ll like this. If not, just make wings and move on with your life. Here’s the real winner, and I feel very awkward saying this because I’m not really one for self-promotion. This is my recipe for slow-cooker BBQ tofu. It is a modification, adjustment, and reimagining of two recipes. 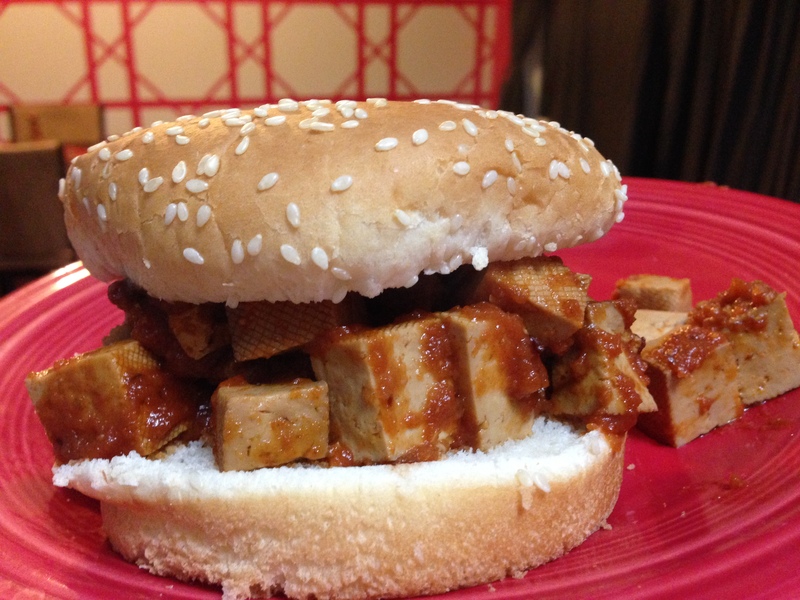 One is a BBQ tofu recipe from Not Your Mother’s Slow Cooker Family Favorites. I made that recipe straight-up one time and found it lacking. I thought the tofu itself was really good. The slow-cooking gave it a kind of roasty edge. The sauce tasted too ketchuppy, and it tasted like it wasn’t done yet. At the same time, the tofu definitely couldn’t have been cooked any longer without ruining it. The other recipe is the smokey onion tofu marinade from Bean by Bean by the impossibly-named and impossibly wonderful Crescent Dragonwagon. By marinating the tofu pieces overnight in her marinade, slow-cooking the sauce for some extra time on its own before adding the tofu chunks, then finishing them all together, this winds up being, quite honestly, my favorite BBQ sandwich. I crave this stuff. I feel I have to say a little more about my changes to the sauce recipe. As I said before, when I made it the first time, it was ketchuppy. What it was really missing was smoke. Well, that’s a difficult one for a tofu slow-cooker recipe, right? I added in smoke wherever I thought I could find it. The Dragonwagon marinade uses liquid smoke. I added liquid smoke to the BBQ sauce. I also added a couple chopped chipotles in adobo, aka smoked jalapenos. Those adjustments finally brought the smokey flavor. It is with much trepidation that I release my baby out into the wild, but here it is. The recipe that I’ve given the most work and the one of which I am the most proud. Serve it at a Super Bowl party and make the veggies/non-veggies fall in love with you. Or keep it all to yourself. The first step is to marinate the tofu pieces. Combine all ingredients except for the tofu in a food processor fitted with the blade attachment. Pulse to break it up then process until it’s ground as fine as you can get it. This is a sloppy, liquid marinade with little bits of onion in it. It’s going to leak out of the food processor on to the counter. Just a heads up. If you have a very intense blender (I don’t) like maybe a vitamix, you could maybe do this in the blender and prevent that mess, but a normal blender will not break up an onion. You don’t lose enough marinade to make this a big deal. While the tofu is still marinating, get a jump start on the sauce. In a medium bowl, combine ketchup, brown sugar, soy sauce, chipotles, vinegar, mustard, paprika, garlic powder, citrus seasoning salt, bitters, and liquid smoke. Stir to combine. Coat the inside of the crock with nonstick cooking spray. Pour sauce into crock. Cover and cook on low for 1 1/2 hours. Stir the sauce well. Brush excess marinade off of the tofu and add it to the crock. Just the excess. Some bits will cling to the tofu pieces and that’s absolutely fine. Cover and cook on low for another 4-6 hours, until very hot and fragrant. Serve on rolls. I like this with raw onions and pickles. I think it needs a little sharpness and snap.